& fairy lighting, can be added to this package. Perfect for bigger size venues. SPECIAL OFFER, WE AT LSC WOULD LIKE TO OFFER YOU 10% OFF OF ALL HIRES UP TO NEW YEARS EVE, JUST MENTION THIS AD AT TIME OF BOOKING. So you cant have a party without some party lights to give it that extra effect, have a look at some our offerings. This mini crystal magic ball runs sound to light so will move to the music, these are amazing for lighting up the whole room with amazing colours and patterns, Perfect for house parties, Parties in halls, Clubs and bars. 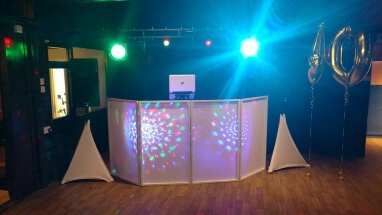 We have many other disco Lights which will be perfect For your Xmas & New Years Parties. Also Not Forgetting Snow machines as well, just in case we don’t get any ! WE HAVE LOTS MORE PARTY HIRE PRODUCTS TO CHOOSE FROM TO MAKE THIS CHRISTMAS AND NEW YEAR 2017, ONE OF THE MEMORABLE IN YOUR LIFE.